Last edited by skyknight; December 17th, 2009 at 05:14 AM. This first one is a ruined kingdom, bits of road and bridge remain, the glaciers are melting and pouring inot a deep ravine, this is 11 MS and 3 RTTFF, 2.5 tunras 2 VW and 1 modded master set. Those look awesome! I like the first one a lot. I haven't been able to get my hands on some Tundra yet. Now I can't wait. That first one is nice looking Skynight! Amazing maps! 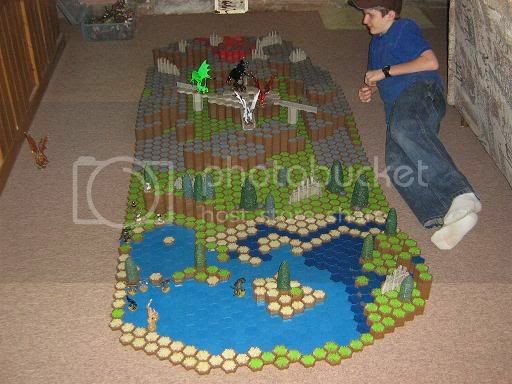 Man, that floor map is huge! 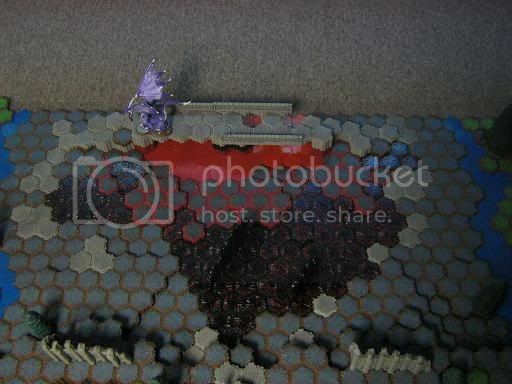 What are the dark hexes?? Keep up the great work. Thanks for sharing! 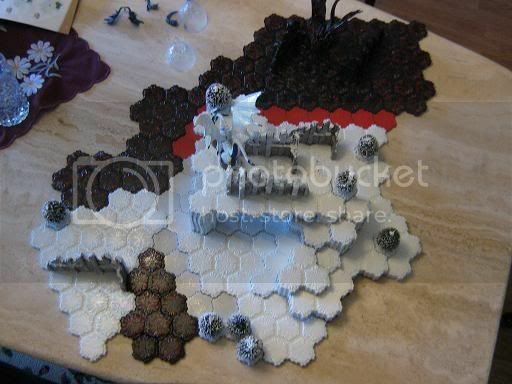 The dark hexes are cooling lava, I play them as small and medium figures are fine while large critters can break through on a skull roll for 1 damage. It's a little guy hide out, good for ranged figs. 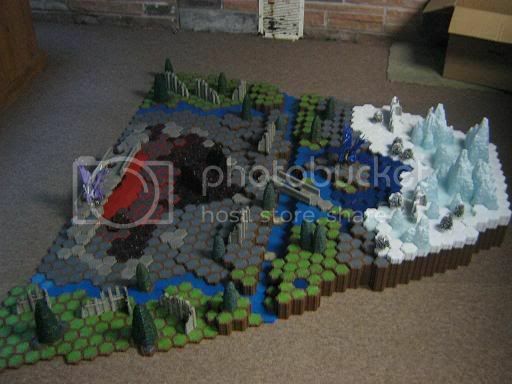 Endpawn did something similar with his terrain. 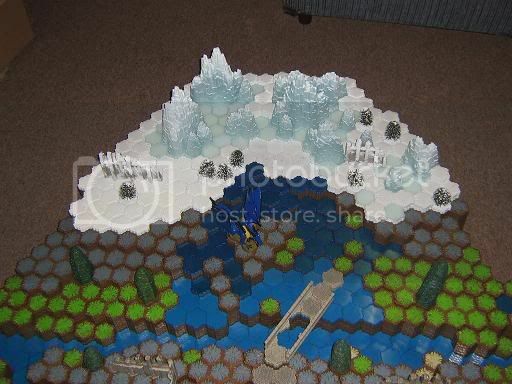 Also half that snow you see is custom as well, I have better pics on my cstom and repaint page . the black goo looks really evil and forboding. my word your kid could fit on that map! Thanks Doug, by the way can you see the two dragons in the snow and lava pic. Nice maps, indeed, sky. I find myself thinking in terms of sculpting a map, rather than building one, these days. Like you, I do mine "on the fly." 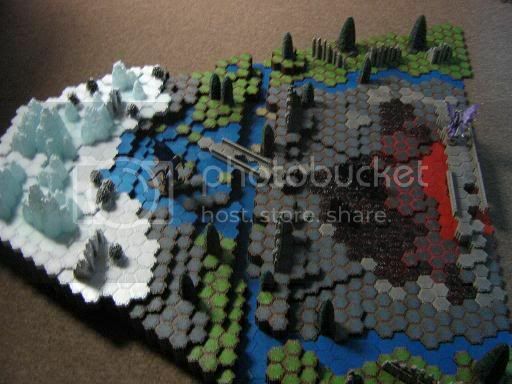 I have a general notion of what I want (such as three mountains and a canyon, or something like that) and then begin to sculpt that with the hexes. It is as satisfying, for me, as playing the game on the maps. I saw the snow dragon but it took me awhile to find the black one. Its really well hidden. Great maps! The last one is freakin huge! 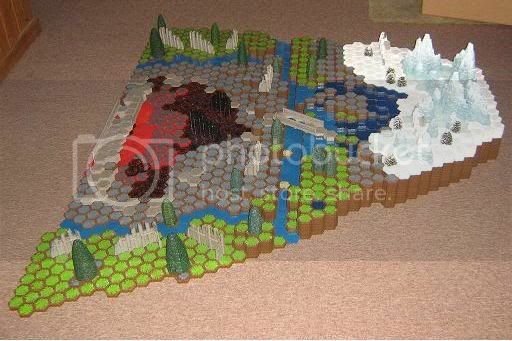 Id love to play or build a map that big. It makes me sad that I cant tho. Hopefully somday I will have enough peices to make a huge map so that you have to walk a few feet to get to the other side. Maybe take a few days for the armies to reach one another to finally begin the fight. (That may be a bit boring tho) I dunno. But those are really great maps! Hope you enjoyed playing on them! Those are brilliant, the Tundra looks massive on the first one. Is it modded tundra? That one map is gimongous! That is really amazing!